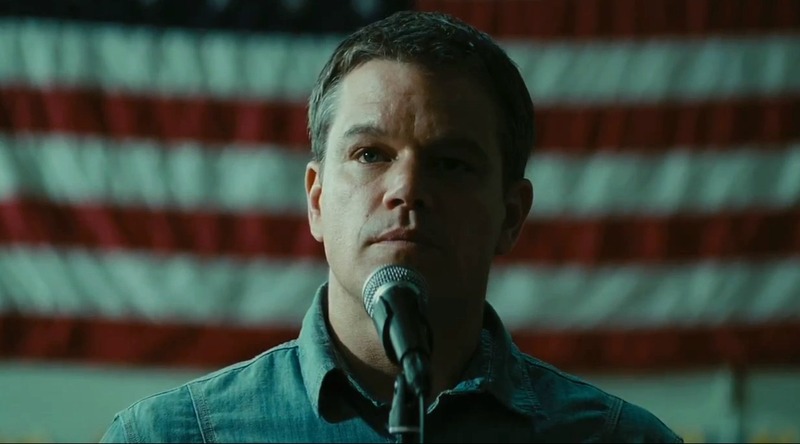 Steve Butler (Matt Damon) is a very calm, measured man. He has to be. As a representative of a corporation that specialises in the mining and production of natural gas, it is his job to convince people to sell the drilling rights to their property. In essence, he has to persuade them that any hope they might have of eking out an existence any other way is now non-existent, that the life of the American farmer has died, and selling is the only way forward. With his partner Sue (Frances McDormand), Steve goes from dying town to dying town, promising salvation whilst smoothing over any tricky questions people might have about how safe the extraction process (a dirty business known as "fracking") actually is. You don't convince people to give up their old way of life by being argumentative or difficult: easy-going is the way to go. He's such a good-natured guy that he borders on being boring, a pitfall that Promised Land spends the vast majority of its time tap dancing around the edges of, occasionally setting foot on one side or the other. It's such an earnest, well-meaning film that it often forgets to be particularly dramatic, with its few fractious moments providing much needed tension in a story that otherwise feels a little too subdued. There's something admirable about the film's unwillingness to totally condemn the actions of Butler and his employers, or to paint opponents such as militant environmentalists (represented in the form of The Office's John Krasinski, who also co-wrote the script with Damon from an idea by Dave Eggers) as extremists, but balance proves to be the enemy of drama. For the most part, the story moves at a very gentle and lax pace, as Butler arrives at a town, meets the locals and starts to inveigle his way into their confidence. The story picks up when things start to go against Butler, first after a high school science teacher (Hal Holbrook) questions the safety of fracking at a town meeting, then later as Krasinski's character arrives and starts graphically depicting the potential dangers of fracking. Even these threads of the story lack any real tension to them, instead coasting on the charm of Damon and the rapport he forms with the people around him, particularly a teacher (Rosemarie DeWitt) who he takes a liking to. Fortunately, Damon has charm to burn, and the quality of the performances prevent the film from becoming interminably worthy, especially since Van Sant does such an admirable job of giving a sense of the life of the town and its people. But there's only so much that they can do with a script that is so on the nose as to distract from the solid character work on display. It should come as no surprise, then, that the best moments in the film are those when Butler is forced to be confrontational. In one scene early on, he is forced to put considerable pressure on a local politician (Ken Strunk) who tries to extort money from Butler in exchange for votes at an upcoming town meeting. After arguing that even a whiff of opposition could upend the whole deal, Butler counters by painting a bleak and uncomfortable image of what could happen if the deal doesn't pass. The corporation won't re-negotiate, they will just leave. They will take their money to other towns whilst Strunk and the people he represents will watch their town shrivel up even further, until one day the corporation returns and buys the land for next to nothing. It's a great scene, probably the best part of the whole film, because of how utterly sympathetic Damon makes Butler seem, even as he basically threatens a low-ranking public official with visions of an apocalyptic future of slow, inexorable decay. The quiet, pained quality Damon brings to Butler's voice underlines the meaning behind his words: please, don't make me destroy you. It brings a complexity to the character that is lacking throughout the rest of the film. It's a scene so rife with possibility - not to mention subtext about the human face of monolithic corporate entities - that the film never really recovers from it. That side of Butler never really surfaces again - although there is a later scene of him confronting a group of locals and making many of the same points in an angrier, more impotent manner that makes for a nice contrast - and the film settles into an agreeably familiar groove. It's essentially an archetypal story of a corporate guy who reconnects with his humanity in the vein of Jason Reitman's Up in the Air, though with less of that film's brio or flair. Director Gus Van Sant has long oscillated between small, uncompromisingly personal fare like Gerry or Elephant and more mainstream works like Good Will Hunting, and Promised Land falls solidly in the latter camp. Despite flashes of inspiration, it's ultimately too well-meaning for its own good; by treating its subject matter in an even-handed manner, it winds up a little bland. The performances ultimately save it from mediocrity, but it stakes its claim to the middle of the road and steadfastly refuses to sell for anything else.